We will open the exhibition of SOMIYA Ichinen to celebrate the publication of his works. The collection of his works was published last year to trace back his achievement with more than 100 paintings of oil and watercolor created from the time around the entrance to the Art School of Tokyo to his last years, including other sketches and essays. 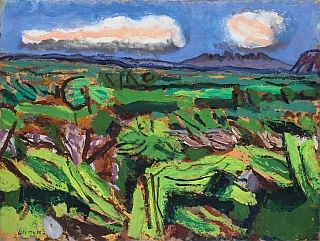 He left his name in the modern Japanese art history, showing his natural talents as a pleinairist and a painter of colors. He also created essays, calligraphies and short Japanese poems (tanka) towards the end of his life, and fulfilled his destiny of 101 years as an artist. We exhibit around 60 works, range from the oil paintings of large size about 90.9 by 72.2 cm to watercolor paintings, wishing you to overview his great works at our gallery. 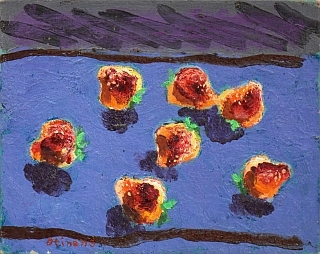 Strawberries, oil painting, 27.3 × 22.0 cm.